So here’s the plan: each week that the gospels are covered in Sunday School, I will post one question from my book along with a brief discussion of the issues that it raises. Most ancient manuscripts of Mark end after 16:8 and early Christians do not seem to know any of this chapter after verse 8. The style, vocabulary, and themes in Mark 16:9–20 are quite different from the rest of Mark. Therefore, the vast majority of scholars believe that the Gospel of Mark originally ended with verse 8 and that verses 9–20 are a later addition by another author. It is also possible that the original ending (any material after verse 8) was somehow lost. Suppose for a moment that, as most scholars believe, the Gospel did originally end after verse 8. Why did Mark write such an abrupt ending? What effect does it have on you as a reader? If you want more information about the ending of Mark, you can read this. (Even the new Institute manual mentions this issue here.) This might seem a petty issue to focus on in a lesson that is about the resurrection of Jesus Christ, but stay with me for a moment. 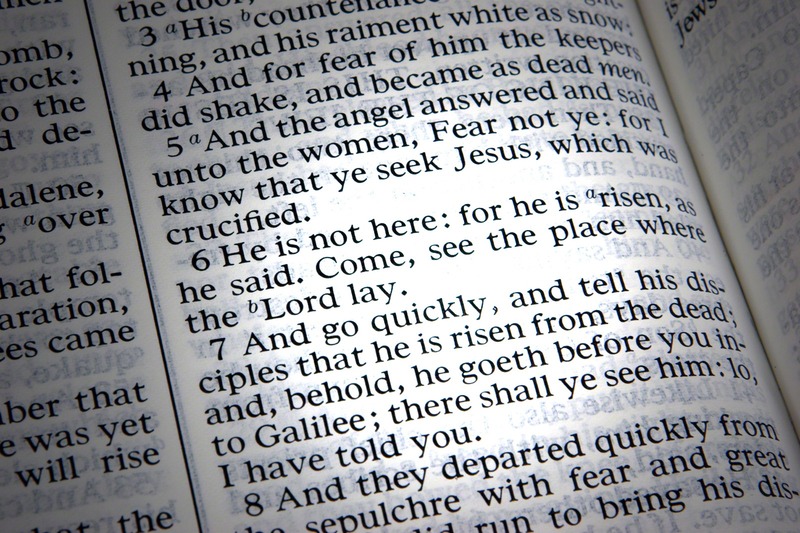 While it is possible that the original ending to Mark is now lost, think for a moment about what it would mean if Mark deliberately ended the gospel with the words “And they went out quickly, and fled from the sepulchre; for they trembled and were amazed: neither said they any thing to any man; for they were afraid.” No resurrection appearance. Just these disciples leaving in fear. Why would Mark do this? Recent thinking about the Gospel of Mark has emphasized its nature as an oral performance (more on this idea here). So imagine that you are listening to the Gospel of Mark. The speaker has been at it for an hour and half and is now nearing the end. It was devastating when the twelve fled from Jesus, it was worse when Peter outright denied Jesus, and there was no one left to carry the “good news” to the world when Jesus died. But then–the women return! The young man tells them not to be afraid because Jesus has risen. This is great! Now surely they’ll tell everyone! But then, abruptly, they run away silent and fearing. There is no one left . . . except for you. Performance analysis of Mark has shown how the audience of the gospel has been involved and empowered to be disciples. And now the ball is in our court. There is no one else to share the good news with the world–no one but us. We can’t pass the sign-up sheet along with the thought that surely someone else will fill in the blank, because we are the last person on the row, filling the last seat in the class. We do it, or it doesn’t get done. This ending is so much more powerful than a resurrection appearance: it creates a sense of urgency in the audience to proclaim the good news that Jesus Christ has risen. Note: this will be the last lesson note in this series since my plan was to cover only the gospels. Thanks for reading! Are you tempted to change your plans? It is only June after all. It would be appreciated. I shouldn’t speak for Julie, Jader3rd, but this is where her book ends. The rest of the year, we’re on the rest of the NT and you could pick up with James Faulconer’s “New Testament Made Harder” (Maxwell Institute 2015) for a similar but different take. On another note, you could just try working in N.T. Wright’s Faithfulness of Paul (Fortress 2014), which is Volume IV of his Christian Origins and the Question of God. For a separate take on Hebrews (which Wright didn’t address to my satisfaction), try Attridge or Koester. Julie needs to continue her slog on the BYU NT Commentary volume for Mark, if I’m not mistaken (unless the release is to drift to 2020, which she, more than anyone, doesn’t want to happen). Hi Julie. Or at least pick it up again when we get to Revelation. I second the ‘it would be appreciated’. Either way, thanks for all your work on this, Julie. These have been wonderful, Julie. Thanks! I lean on your posts for understanding and teaching ideas. Perhaps at some point you would put together a directory of the posts you once wrote about Revelation so that we’d have easy access to them when the curriculum gets that far? It is an important question, Julie, and I like your options. Throughout, I think, Marc is more a manual for prospective martyrs than someone who exudes tidings of comfort and joy. The rather dismal ending might be tied into that. Thank you. I’ve found your comments empowering. It is a really useful for reflection o start with a question or fresh framing. I hope you will keep sharing. Julie – it doesn’t apply to what you’ve written here, but I’m curious as to your take on Mary Magdalene and her importance to the Savior. Does anything that happens in the Garden of the Tomb in the Gospels indicate to you a closer relationship than master/disciple? Sariah, no, it does not. I presume that underlying your question is the question of whether Mary was married to Jesus. There is no canonical evidence for that idea. The belief often stems from a line of thinking that basically amounts to the idea that if she had a close relationship to Jesus that that must indicate marriage, but that thinking, in my mind, unfairly limits women (as if all they were good for was marrying) by not acknowledging her role as a key disciple. So I am not sympathetic to it. Other arguments for the marriage work backwards from the current emphasis on marriage in LDS thought and/or historical LDS readings of certain events in the gospels that, I think, are foreign to their original context.